E-bike usage worldwide has experienced rapid growth since 1998. A total of 700,000 e-bikes were sold in Europe in 2010, up from 200,000 in 2007 and 500,000 units in 2009. "The worldwide electric two-wheel vehicle market is expected to grow at a compound annual rate of 9% through 2016" a report released by Pike Research in 2010, a for-profit market research firm. Under such background, Airwheel E6 E-bike makes its international debut under the new marketing slogan, “Free intelligent life.” Here comes the details of Airwheel new arrival—E6 electric bicycle. From the externality, the solid X shape with independent patent technology is appealing. After 12 working processes, the surface is non-corrosive, its service life as long as 5 years thanks to the low temperature painting technology. To gain comfortable riding experience, E6 foldable electric bike chooses the rubber saddle in left-right design with balanced force and good ventilation. With dual damping system, Airwheel E6 electric assisted bicycle can adapt to various road conditions and ensures a comfortable riding experience. 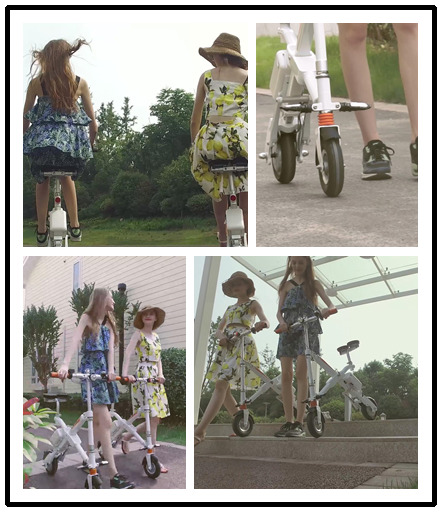 Also, Airwheel E6 adopts high-brightness and energy saving LED headlight, foldable pedals made of high strength alloy. One key to fold to save space. High strength alloy kickstand is easy to park. From the internality, 300W powerful customized high performance hub motor, integrated with the electrical power drive system, transmission device and the electrical braking system, offers more powerful and stable force. In addition, Airwheel E6 is coupled with car-level Li-ion battery set, light and delicate. Imported Panasonic 18650 Li-ion battery guarantees sufficient power supply. With the addition of USB port, Airwheel E6 e-bike is to provide more possibilities. Furthermore, the creative black technology C-AT Vehicle Control System is upgraded by Airwheel after thousand times of experimental test to achieve better stability and operation. Airwheel E6 offers optimized power scheme, agility and stability in emergency braking after accurate calculation. These stunning details are surly to bring you a well-pleasing vehicle.